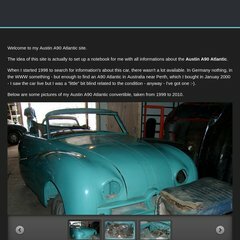 www.A90atlantic.com - Austin A90 Atlantic . Topics: Workshop, Technical Info's, Prices, Gallery, Rebuild, and Family. Ud Media Gmbh (Nordrhein-westfalen, Neuss) is the location of the Apache server. The programming language environment is PHP/5.3.8-pl0-udmedia. Its 2 nameservers are ns3.powerdns.de, and ns4.powerdns.de. PING www. (194.117.254.50) 56(84) bytes of data.